This event, held at the Beech Alpen Inn, was attended by quite a few business people from Beech Mountain and Avery County, as well as some four legged neighbors on that frequent the Inn. These 6 and 8 point bucks caused quite a stir when they locked horns for a show of strength. 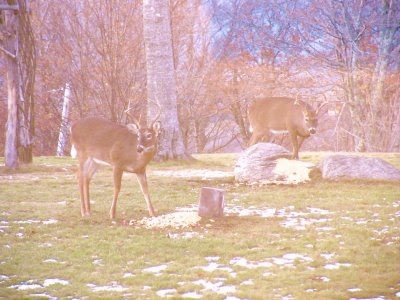 (Sorry for the quality of the photo but it was taken through glass so as not to disturb the bucks). Even some of the Beech Mountain Club members were able to attend the event. The food was absolutely wonderful and we appreciate the efforts that Fred Barth and Steve went through to make this a memorable event. What a beautiful building and such a nice cozy, yet large, room to be able to have this event in. We look forward to the next get together.